Through the years I have run across many Mexican immigrants that have achieved success as winegrowers, winemakers and winery owners in California. The story of Jesus Guillen is the first such story I have met with in the Willamette Valley. Jesus Guillen, Sr., came to Oregon in 2000 from Chihuahua, Mexico, encouraged by a Mexican immigrant working as a winegrower. He ended up at White Rose Estate as the vineyard manager. His son, also named Jesus, graduated from the University of Chihuahua in 2001 with a degree in computer systems engineering. He came to Oregon on a visitor’s visa, immediately fell in love with Oregon, and decided to stay. In 2002, his mother, brother and sister immigrated to Oregon. Jesus studied English at the local community college, read extensively about viticulture and winemaking, and developed a palate for the local wines. His epiphany came from two wines: the 1999 Archery Summit Arcus Summit Pinot Noir and the 1999 Adelsheim Elizabeth’s Reserve Pinot Noir. Jesus became a vineyard worker for Patricia Green in 2002. He also worked with his father, Jesus, Sr., at Laurel Ridge Winery where Jesus, Sr., was helping Greg Sanders of White Rose Estate make his wines. When the winery was completed at White Rose Estate, Jesus started working in the new winery’s cellar. At the time, Mark Vlossak of St. Innocent was the consulting winemaker, and Jesus acquired much of his winemaking skills from him. He also received some mentoring from Gary Andrus. Because of his considerable talent, Jesus was promoted to winemaker by 2008 and now crafts the White Rose Estate wines with producer and owner Greg Sanders. Jesus launched his own small label in 2009 with the 2007 vintage, sourcing fruit from Vista Hills Vineyard which is near White Rose Estate in the Dundee Hills. The wines are vinified in a similar fashion to those of White Rose Estate with 100% whole cluster (since 2010) and native yeast fermentations, basket pressed, and aging in neutral French oak (Dreamcatcher and Damian), or 100% new French oak (Adrian). Damian and Adrian are aged sur lie. Adrian is built for ultimate complexity and is aged in 100% new French oak. It is bottled when Jesus feels the oak is well integrated. The Guillen Family Pinot Noirs tend to be slightly more full-bodied and extracted than the White Rose Estate Pinot Noirs so they have their own character. Total production of 3 Guillen Family wines is only about 80 cases. Guillen Family Wines are produced in such small quantities they quickly sell out so I hesitate to rave about them. I was honored that he was willing to open the following eight wines for me. 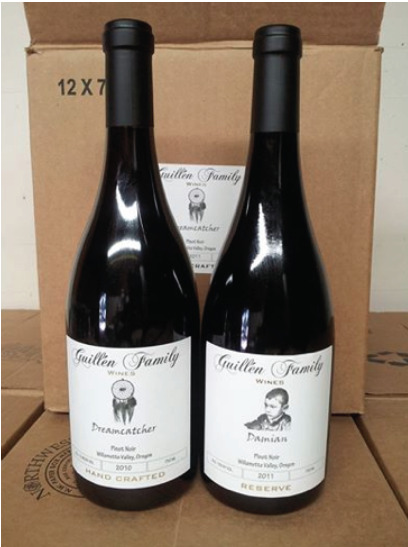 The wines are sold through a mailing list at www.guillenfamily.com. Jesus has also made some wine for Vista Hills Vineyard including the 2011 Vista Hills Vineyard Rollins which is crafted from the oldest block in the vineyard and vinified 100% whole cluster. 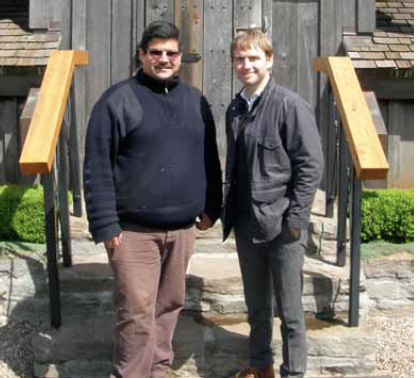 Jesus is pictured below (left) at White Rose Estate with White Rose Estate manager Gavin Joll.